Impact Investing and Sustainable Development: Which Contribution? 4IP had the pleasure of attending a seminar on impact investing organised by the Geneva Chamber of Commerce, Industry and Services (CCIG). With the title Impact investing: quelle contribution au développement durable? [Impact investing: What contribution to sustainable development? ], the seminar invited three speakers to present their thoughts on the industry’s current status and road ahead. Guillaume Bonnel from Banque Lombard Odier & Cie presented how his bank has transformed its conventional investment strategy five years ago to respond to services needed in developing countries. Since then the bank’s investment portfolio has to a higher degree steered its investments towards impactful projects. Lombard Odier aligns impact investments with three pillars: Inclusive finance, Sustainable agricultural development, and SME Impact (access to energy, water and education). To date, the bank has invested in, among others, microfinance to women in India, provided capacity-building farmers in Peru to obtain Fair Trade labels, provided access to energy in Tanzania and West Africa through solar panels, and funded WASH projects in Colombia. Mr. Bonnel mentionned how ICT has leapfrogged in developing countries and how this development have helped the bank’s projects in Africa. On a final note, Mr. Bonnel touched on the subject of Green Bonds that pioneered in Geneva 10 years back and a market with defined use-of-proceeds that has grown by 159% year on year since 2013. Lombard Odier is involved in areas where green bonds can help reduce carbon emissions while being deemed to help in the fight against climate change and support the United Nation’s 2015 Sustainable Development Goals (UN SDGs). This will require substantial investments from private capital markets (to complement government and philanthropy). But the UN SDGs also provide significant opportunities for investors. According to a report by the Business and Sustainable Development Commission, achieving the SDGs could open USD 12 trillion of market opportunities and create 380 million new jobs by 2030. Impact investors have answered this call by tailoring products and funds to specifically address the SDGs as presented by Lombard Odier at the CCIG seminar. Moreover, Fifty-five percent of the GIIN respondents track the performance of at least some of their impact investments to the SDGs, a quarter of which noted that doing so helps them conceive of new investment strategies and opportunities. The CCIG seminar was concluded by a panel discussion with the three speakers and Andrea Baranzini from Haute École de Gestion (HEG-) Geneva. Among the many insightful thoughts that were shared during this panel debate, the topic of impact measurement was further discussed. A point was also raised that while ESG ratings, e.g. designed to help investors identify financially material sustainability-related risks, is a good practice, it does not always provide the needed solutions to fulfil the SDGs. See Figure ii: Sector allocations by AUM and percent of respondents in the eighth edition of the GIIN’s Annual 2018 Impact Investor Survey, which provides a detailed look at a diverse, dynamic, and growing impact investing market. In 2018 GIIN received responses from 229 organizations that collectively manage USD 228 billion in impact investing assets. 4IP Group represented by Managing Partner Thibaut Mourgues attended on September 18th the Tunisia PPP International Forum. The event was organized by the Tunisian Government with the support of IFC and EBRD. Over 200 international investors and interested parties attended the forum in addition to 1.000 Tunisian participants. The Tunisian Government, led by the Prime Minister Mr. Youssef Chahed, introduced an impressive PPP pipe-line of over 30 projects at various stages of preparation. The most advanced projects pertain to the transport and energy sectors, amounting to more than 5 bn euros. The Government indicated that despite the tense financial situation, their sound economic policy will favour sustainable growth, addressing unemployment and regional disparities issues. As all speakers mentioned the key to PPP success is the quality of preparation, combined with the involvement of world class advisers that donors are ready to support. In this context, following to talks with PPP Unit top management, 4IP group is well positioned to support the implementation of a PPP program which benefits citizens, while attracting international investment interest. On 17th and 18th of September, 4IP Group Managing Partner and current President Christian Kingombe and 4IP Group Research Associate, Torkil Hvam Sørensen, attended the Third Annual ZUG IMPACT SUMMIT, entitled “Earth and Finance”. Earth & Finance was this year’s summit theme, looking into ways to improve the livelihoods of people and conserve and regenerate the planet. The Zug Impact Summit took place at the Theatre Casino Zug in Switzerland. This was 4IP Group’s inaugural participation in this event as Alliance Partner of the Swiss Impact Investing Association (SIIA), in our quest to participate in the creation of increased awareness for impact investing in Switzerland, while at the same time matching Swiss Impact Investors with investment opportunities in Emerging and Frontier Markets (see our event showcase). 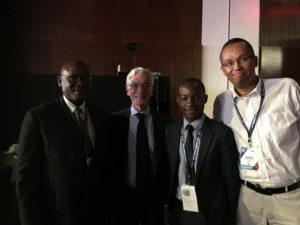 The two 4IP Group delegates met with a unique mix of entrepreneurs, impact investors, and thought-leaders. The SIIA Zug Summit gathered numerous inspirational speakers, such as Rodney Schwartz Founder, ClearlySo, Martin Palmer Secretary General, Alliance of Religions and Conservation, along with world-class educators, like Robert Rubinstein Chairman from TBLI Group. The second day of the event featured four practical showcases of Gender Equality Investments; five Female Founders pitches and finally, an impressive 18 Water and Sanitation pitches, as part of the Innovate 4 Water part of the programme. We look forward to building on our exchanges with you to achieve objectives beyond just financial returns. On 5th of September, Christian Kingombe, Managing Partner 4IP Group, gave a lecture on Impact Investing and Purpose Driven Leadership at the Geneva Global Leadership Programme. This Global Leadership programme provides senior university students and young professionals with an in-depth briefing and exposure to the global policy debates on issues related to different aspects of sustainability and governance of the global system. On May 30th , 4IP Group LLC hosted at the Impact Hub Geneva the SECOND IMPACT WORSHOP MEETING of the ESAFON led by the SWISS IMPACT INITIATIVE. 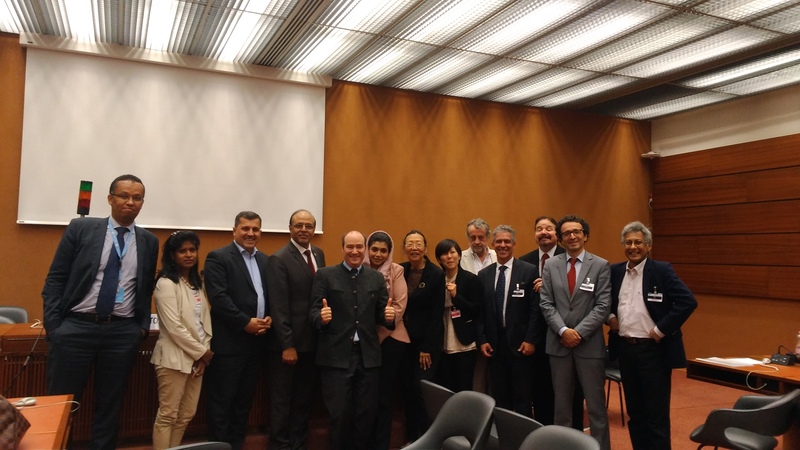 The objective of the meeting, which was attended by a representative group of the Geneva Impact Investing Eco-system, was to discuss how the new Swiss Impact Initiative could foster the development of the impact investment market globally from Switzerland. 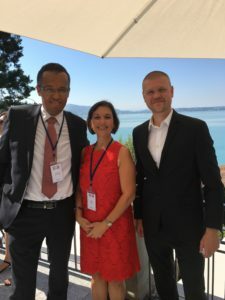 This would take advantage from the fact that the Swiss market already plays a leading role in global impact investment and as such has the potential to significantly influence and scale impact globally. Following the European Commission’s March 2018 report «Incorporating sustainability when providing financial advice» several concrete action plans were agreed upon, which will be disclosed in due course. Stay tuned as this important initiative is being rolled out. The UNECE International PPP forum held in Geneva 7-9 May oversaw important news. UNECE (United Nations Economic Commission for Europe) and UNECA (United Nations Economic Commission for Africa) have agreed to join forces to conduct joint Business Advisory Board (BAB) missions to Africa. These missions driven by private sector experts will support African countries in establishing PPP framework, designing effective and bankable PPP programs or projects that will be oriented toward the Sustainable Development Goals. As an advisor to the BAB, 4IP welcomes this move which will improve coordination and leverage of the international community to support the African continent. During the same meeting, the founding assembly of the World Association of PPP Units (WAPU) was successfully held. The Association will aim to strengthen the cooperation between PPP units and foster the transition toward People’s First Public Private Partnerships that will directly support SDGs. The Executive Committee of 7 members will comprise representatives of PPP units as well as of private sector. Thibaut Mourgues, Managing Partner of 4IP, was unanimously elected a member of the Executive Committee. 4IP will continue to promote sustainable development through PPPs and will do its utmost to make this initiative an important contributor to sustainable PPPs implementation worldwide.